Its antioxidant, zeaxanthin, filters out harmful blue light rays thus playing a protective role in eye health, warding off damage from macular degeneration. Its high content of beta carotene and vitamin C help protect against asthma. Its abundance of potassium helps keep blood pressure low and stable. Its wide range of antioxidants and high fiber content protect against several cancers, including prostate and colon cancer. Its high fiber and moisture content keep the digestive tract healthy and regular. Its high water and electrolyte content protect against dehydration. Its abundance of choline promotes sleep, muscle movement, learning and memory. Choline also helps maintain the structure of cellular membranes, aids in the transmission of nerve impulses, assists in the absorption of fat, and reduces chronic inflammation. Its high vitamin A content keeps hair and skin moisturized and healthy. And besides all this, it tastes delicious! Well, that is, if you pick the right one. We’ve all had the experience of picking a “lemon” when choosing a cantaloupe. 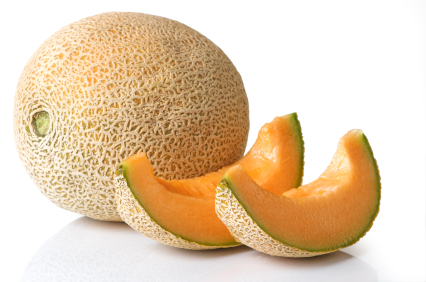 At their best, cantaloupes are tender, juicy, and sweet. At their worst, they’re the flavorless hunks you push aside in a fruit salad. So how do you choose a good one every time? Look for a taut rind without bruises or cracks; the peel under the bumpy webbing should be golden (NOT light green!). 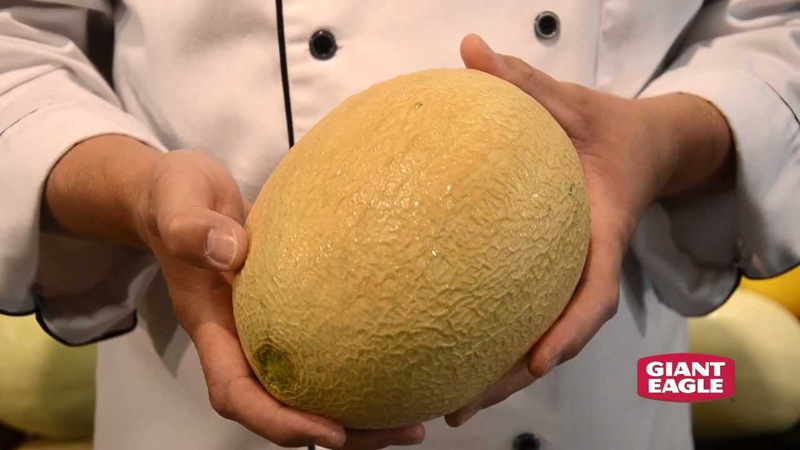 The melon should feel heavy for its size, and the blossom end, opposite the stem, should yield to slight pressure. Also, you need to sniff it. (Yes, be that person in the produce aisle.) It should smell sweet and almost floral. Have a winner? Eat it straight up, or combine it in unusual ways with other foods (it blends well with salty meats and cheeses, for instance). As an example, try this salad: Fresh baby spinach with cantaloupe cubes or balls, sprinkled well with roughly chopped walnuts. The color mix is beautiful and the flavors are yummy. 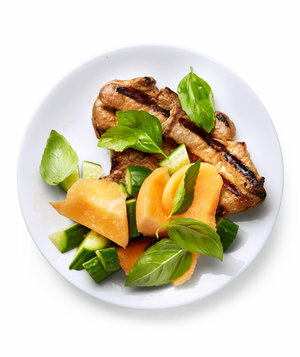 Cantaloupe paired with grilled pork chops and fresh basil is another taste treat. 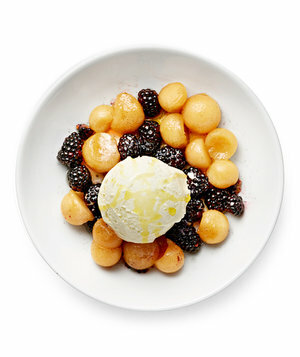 Cantaloupe with blackberries is really good when served with vanilla ice cream. 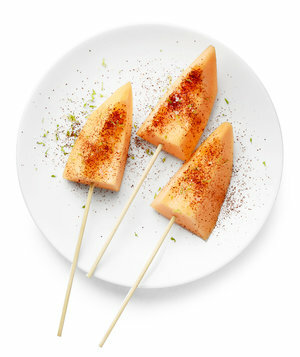 Cantaloupe always works well on skewers, and when sprinkled with lime zest and chili powder, you have a flavor match that sparkles. It’s also wonderful in a pasta salad. 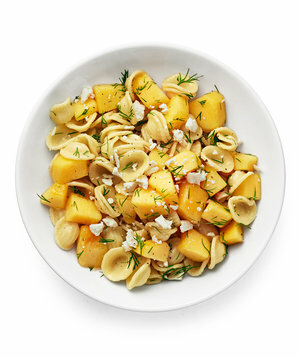 Try matching it with shell pasta, feta cheese and fresh dill. Place the cantaloupe in the blender and add the lemon juice and cider. Puree until smooth and taste for seasoning. Add the sugar, if needed. Use the water if more liquid is needed. Pour the soup into a medium bowl. Make an ice bath to chill the soup by combining some ice cubes and cold water in the bottom of a larger bowl. 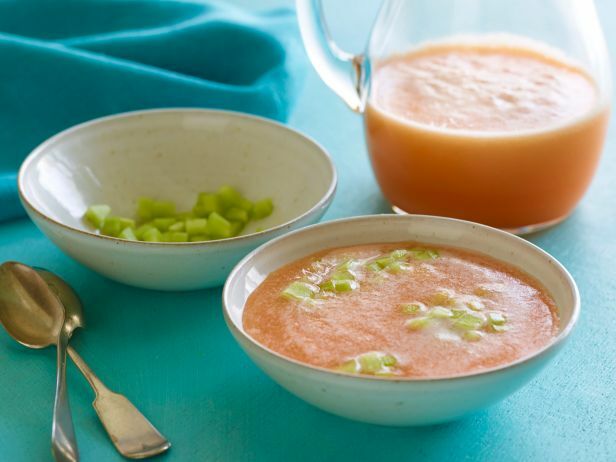 Put the soup in the ice bath and store in the refrigerator until ready to serve. And then there’s nothing nicer than cantaloupe-infused water. This sweet sip doesn’t need much doctoring up. 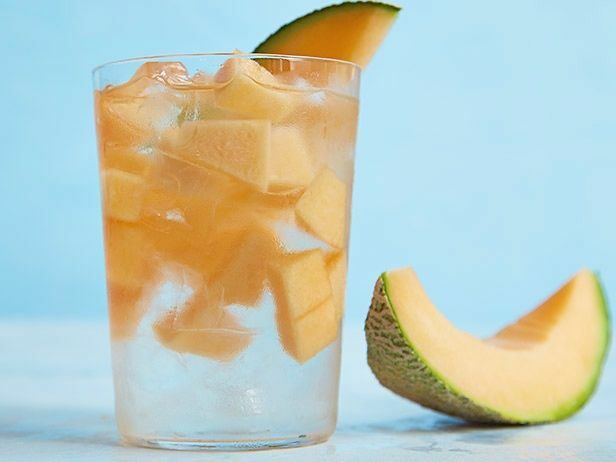 Simply add thin cubes of ripe melon to a frosty glass of ice water for one of summer’s most-refreshing treats. Don’t you just love how nature blesses us with not just healthy, but delicious foods? So this summer be sure to serve up lots of cantaloupe. It deserves the attention!